The type of material you include in your project depends on your research question and methodology—and NVivo lets you import a wide range of materials from interview transcripts and journal articles to audio/video recordings and social media content. This page provides some ideas for collecting your data and organizing it once you have brought it in. Refer to Files for detailed information about the types of data you can import. Capture information about the setting, social context, body language or tone. It also helps to record your first impressions and interpretations—these can be hard to remember later on. You can create or import this information as a memo in NVivo. Record the demographic details of your participants—you could do this in a spreadsheet and then import it (or add it directly in NVivo). When you are out in the field, you may want to record interviews, take photos, clip web pages or make notes. You can use Evernote or OneNote to gather material on your smartphone or tablet. Keep a log of what you are doing—date and time, location, the events that took place, the surrounding conditions and your personal feelings about the events. Do you require consent from all participants? To keep everything in one place, consider importing consent forms as files in your project. If you want to edit audio, video or images you will need to do this before importing the material into NVivo. If you use a smartphone or tablet to record interviews, take photos or make notes—and you want to analyze this data in NVivo—you should consider using Evernote or OneNote. You can also collaborate with other members of your research team using shared notebooks. 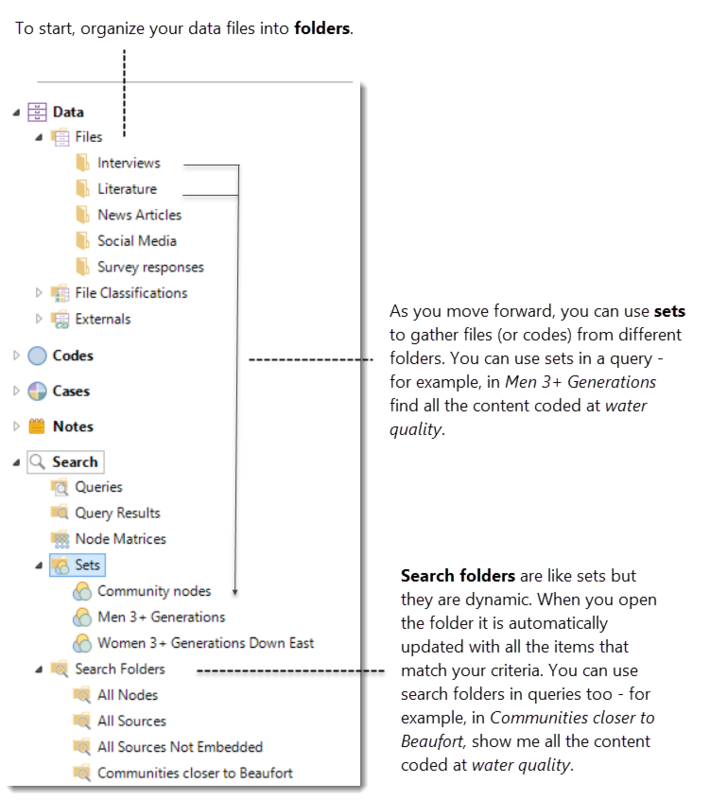 When you're back at your desk, you can connect to your Evernote or OneNote account from within NVivo and bring your material in for analysis. If you have interview or focus group transcripts saved as Word documents (or text files), you can import them as document files in NVivo. If your documents are tightly structured by question, answer and speaker—you can use paragraph styles to format the headings. Then you can use auto coding to gather the responses by question or speaker. You may also want to use annotations to capture the tone of the conversation, including body language and displays of emotion. If you have audio or video recordings of interviews or focus groups, you can import the media as audio or video and include a synchronized transcript. Get your material transcribed using the automated transcription service NVivo Transcription. 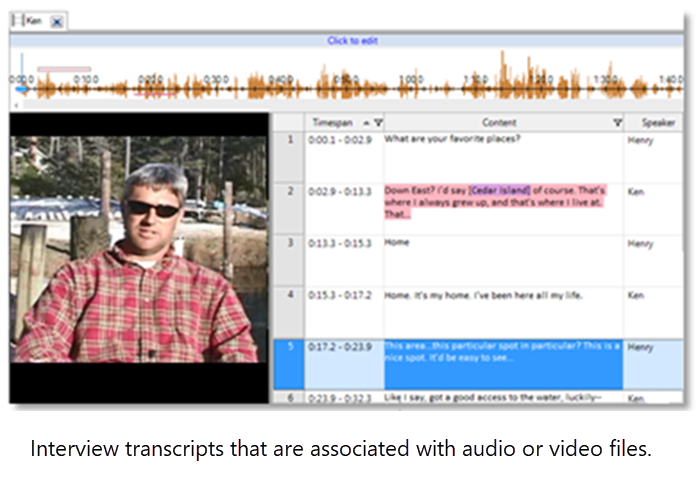 Transcribe the media in NVivo —you can play and pause the media, transcribing as you go. To support this process, you can use shortcut keys or a foot pedal. Import a transcript as long as it is in the correct format. Work without a transcript—you can code and annotate directly on the media timeline. You could add a column to record more detail—for example, you might add a column for Speaker, Body Language or Emotion. This column can then be used to auto code the content (you might want to gather all the comments for a particular focus group participant or gather all the Enthusiastic responses). There are benefits to transcribing your own material—the transcription process brings you closer to your data (helping you to form early impressions) and you have control over the accuracy and completeness. Of course, this may not be practical on large scale projects and you may prefer to get your materials transcribed using NVivo Transcription. If you decide to work with audio or video directly (without a transcript), you will not be able to use Word Frequency or Text Search queries to explore the content. You can also use file classifications as a way to organize or compare files based on their attributes—for example, find all the articles by a particular author or all the interviews that were conducted by Mary. If you import bibliographical data from reference management tools like EndNote any new files are automatically classified.